Roast and grind peanuts and cumin seeds.Boil potato and peel the skin after it cool down. Mashed it well in a bowl add rajgira atta and rock salt, grind peanuts, chopped chilies , red chili powder(optional) and mixed well. Now add little water and make neat dough.Keep them aside for 10-15 minutes. Heat up pan or tava on medium flame .Dust some rajgira atta on the surface and make roti of diameter 6 with the help of roller, add some oil and cook the roti for from both the side, Do the same for others. 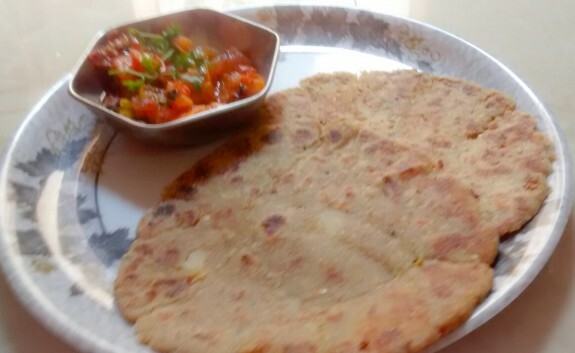 Now the spicy and delicious Rajgitra roti is ready to serve. Serve it with tomato sabzi or curd.